Wow, I cannot believe that the SparkPittsburgh Step Challenge is coming to an end. I know that for me personally, the October 20th American Heart Association AHA Heart Walk will not signal the end of my quest to get my steps in and to continuously improve my health and habits. I have really enjoyed being a part of this challenge. I check the leaderboards regularly to see how my company Covestro is doing and how I stack up against the other walkers. I am proud that I will reach over 400,000 steps by the time the winning teams are announced in the shadows of PNC Park. I also take satisfaction in the performance of the other walkers on the Covestro team. My friend and colleague Doug Hamilton should reach 1 million steps soon. What a role model! October 1st of this year marks the fourth anniversary of the moment I emerged from the fog of my induced coma. Doctors had chilled my body in a process called therapeutic hypothermia in order to preserve brain and body function following my sudden cardiac arrest (SCA). My wife Anne and I reflect on that moment, feeling as if that took place forever ago. We celebrate that day as my new birthday every year. Being asked to be a spokesperson for the Step Challenge has simply warmed my heart as I reflect on how fortunate I am. Earlier this week I actively participated in a Health and Benefits Fair at Covestro. I was joined by my good friend Deb Banks, Executive Director of the AHA of Western PA. Our goals at the fair were to provide employees with informational material on heart health and to sign up additional team members for the Covestro Heart Walk team. The afternoon was a success. The Covestro Team should have about 50 members by October 20th, not including pets. We have been able to raise more than $5,000! The Step Challenge has indeed sparked me to find more ways to be active. My wife Anne and I may have put away our pedal kayaks for the winter but will be eager to take them out next spring as we continue to explore this region. We are starting a new season of doubles where we compete against other teams in the Pittsburgh area. I listen to books on tape while walking. I am contemplating buying some new running shoes and will head to the new Balance store in Wexford to get recommendations from Malcolm East (former Pittsburgh Marathon Champion). My cardiologist recommends that I limit my races to 10K at most. My eight marathon will remain out of reach, but I am okay with that. I attended the University of Michigan where I was a cheerleader for two years. 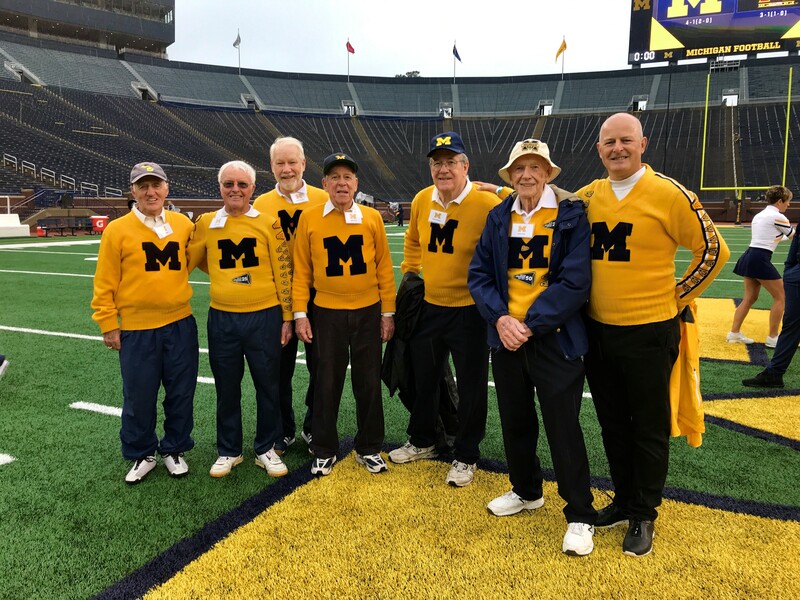 I have the privilege every year to return to Michigan Stadium for homecoming and to walk out onto the field and celebrate with other alumni. I attended the Michigan vs. Maryland game. I may be pleased with the more than 20,000 steps I was able to get the day of the homecoming game. However, I am even more motivated to stay active by my fellow alumni such as 90 year old Dave Lake, who graduated in 1949. Dave makes me wonder #whatsstoppingyou?